Nintendo has huge goals this year. The company is trying to sell 20 million Switches for its current financial year, which runs from April 1, 2018 through March 31, 2019, and has sold five million halfway through that period. Sales tend to balloon near the holidays, but that target could be tough. In the nearly 13 months that comprise the console’s red-hot first year, from early March 2017 to the end of March 2018, Nintendo sold about 18 million Switches. In year one the Switch had a new Zelda, a new Splatoon and a repackaged Mario Kart by the end of the summer and then a new Super Mario game in the fall. Year two of Switch has been a weaker hand. It’s been rich with wonderful games like the indie platformer Celeste or the oddball Nintendo-published Sushi Striker game and Labo cardboard-folding experience, but big-Nintendo-brand games have been scarce. I get it. I get all of it. There’s the pitch from a Nintendo that is riding higher than it has in a few years. Fils-Aime may sell an overly optimistic view of the Nintendo Siwtch’s second year, as the company pushes the Switch and carries the 3DS and 2DS along. That’s his job. 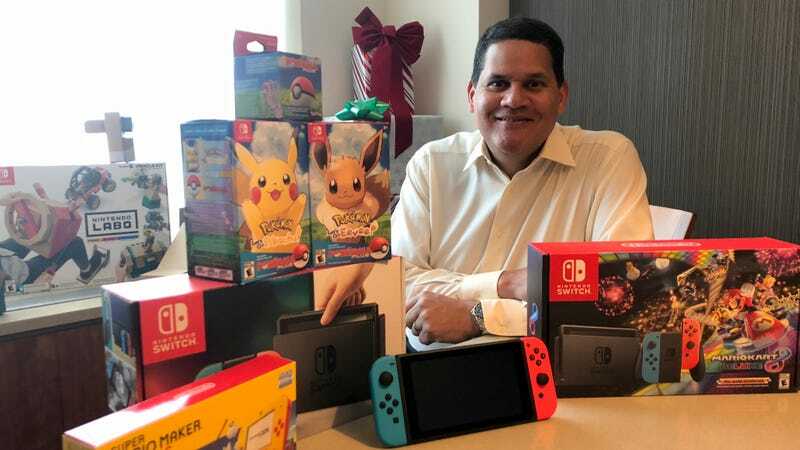 He doesn’t have a bad array of games to sell, but there’s no doubt the boasts will come easier next year and the targets more easily achievable, when there’s a brand-new, all-original Pokémon to sell and an Animal Crossing and maybe some other mega-games, too. I’ll just have to find something different to disagree with him about.